The Qur’an in translation is sometimes wrongfully described by the western reader to be lacking any coherent structure, jumping from topic to topic without making clear the link between them. The rhyme and the innate musicality is lost in translation yet is one of the things that makes the book so powerful. Furthermore, these are key to making connections within a passage of the Qur’an that may not be clear at first glance. 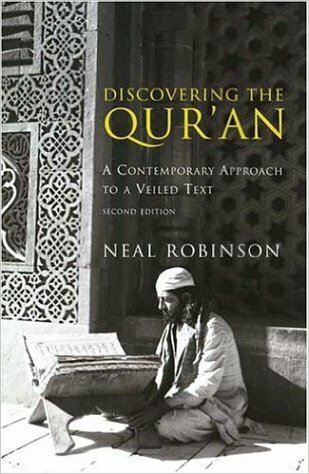 Neal Robinson applies modern methods of literary analysis in order to uncover some of the style and the structure of the Qur’an. His findings are very interesting! Discovering the Qur’an provides many, many more examples of Qur’anic coherence and refined style and much more. Robinson’s analysis is not just limited to poetic structure of Meccan surahs: he extends his hand to the far less rhythmic Medinan passages and discusses the ordering of the Surahs of the Qur’an from a literary perspective. He also dedicates chapters to rebutting Hagarism, Qur’anic chronology (where there are some surprising findings) and also covers historical approaches to the Prophet’s biography. There is also a chapter at the beginning to introduce the Qur’an to the non-Muslim reader. The book serves to bolster the claim that the Qur’an is a work of one author in one period of time rather than a text that arose over the centuries through the works of many. Disproving the claim of multiple authorship seems to be the main aim of the work. With a rigorous methodology and an enjoyable writing style, Robinson’s “Discovering the Qur’an” is a real treat for all interested in Qur’anic studies! Salaam alaikum, MDI you should stay away from this guy. He has no respect for Apologist Abdullah. He thinks Br, Abdullah is a salafist, wahabis and self taught da’ee. Don’t give this guy publicity by re-blogging his post. MDI, We have great Muslim Apologists Brother Sami Zataari, Basam Zawadi, Ijaz Ahmed(Brilliant Young Brother), Yahya Snow(Sweet and polite brother) Asadullah Andulasi,Kaleef Karim etc. No need to appeal to this guy, he thinks very highly of himself and all the others are so-called wahabis disrespecting contemporary scholars like sheikh salih al-munajjid and onislam.net website since scholars on both of these websites made it very clear there is no such thing as wahabi. I would rather stay away from these type of people who try to divide the Muslim community. Masalaam. Sorry, come again? I don’t know what you are talking about :/. I never talk about other people or sects. I literally cannot care less about sectarianism. Yes, You sure don’t remember, but I don’t have a memory of goldfish. When one Muslim attacking Brother Abdullah on his blog and some person commented on that particular blog calling brother Abdullah, Wahabi Salafist you thumbs up that comment. That means you agree with what that person said. I don’t want to name the Person whose blog I am talking about. If you deny what i said, Well in that case then all i can say Allah knows the truth and He knows who is lying and who isn’t. well, ok. I don’t remember what you’re talking about. I see, since you cannot confirm it nor you can deny it, then how about an apology to brother Abdullah. We are Humans we make mistakes, but better one are those who correct themselves. An apology starts with if I ever thumbs up such a dumb comment… I am sorry that’s all it takes. (why am i making a big deal out of it because you sided with the enemy when he expected our support). It doesn’t matter whether brother Abdullah demands it or not and I am pretty sure He won’t. If you don’t know how to apologies, let me show you. My apologies if I offended you Brother Taha, no hard feelings. what the hell is going on! stop this nonsense. if you are believer, this review is useful to all especially Muslims who are losing their faith. lets be thankful for it and neil robinson. for Allah’s sake be thankful for the friends you get in times of fitnah. dont continue to spread fitnah. why dont you do something useful for Islam by doing some research as Neil has done!